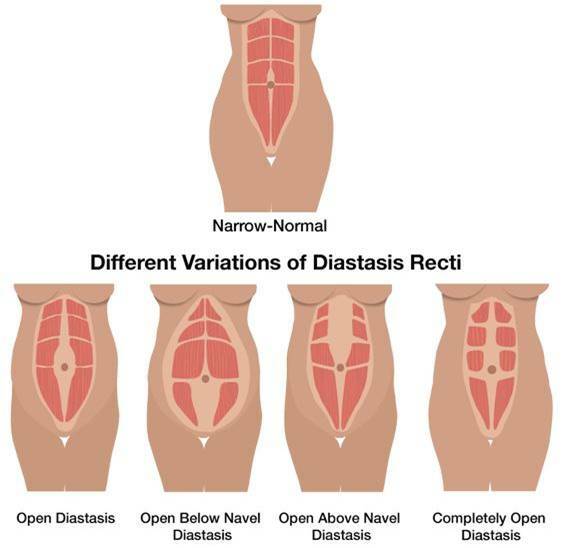 Testing for diastasis recti is a relatively simple procedure, but there are a few common misconceptions. One of the biggest things is that you want test for both width AND depth, the latter of which is actually more important because it shows whether or not there is fascial connection. You can have healed your diastasis – meaning you created new connective tissue between your right and left rectus abdominis – and still have some width separation. 1. Make sure to wait 6 – 10 weeks before checking for diastasis recti after birth as it takes that long for the uterus to return to normal size. 2. Lie on your back with your pelvis in a neutral position and knees bent and feet on the floor. 3. Inhale through your nose, feeling your ribcage widen to the sides and back. 4. Exhale through your mouth and lightly activate your deep core by engaging your pelvic floor, zip up your deep core and wrap your ribs. 5. Slightly lift up your head, keeping your pelvis neutral. If you had a water glass on your pelvis, it would not spill towards you. 6. Take your fingers and palpate along the entire linea alba from sternum to pubic bone. Make sure your abdomen does not dome! 7. First, lightly press down to feel for connective tissue or if your fingers can sink down. Measure the depth in knuckles.If you cannot feel any connective tissue and your fingers sink down, that is an indicator of diastasis recti. 8. Next, then using finger widths, gently measure the distance the distance between the right and left rectus abdominis. If it is more than 2 finger widths apart, that is also an indicator of diastasis recti. Again, width is not nearly as important as depth. You may have healed your diastasis recti, and still have some width. And most importantly, remember that CREATING NEW FASCIAL CONNECTIONS AND HEALING DIASTASIS RECTI TYPICALLY TAKES 6 TO 24 MONTHS! You will need to be very patient, consistent and dedicated. I would love to help any of you on this journey with my DEEP CORE program. I know at times that it can be a frustrating, confusing and slow process to heal diastasis recti, and that is exactly why I created this program. I want every Mama to be equipped with the knowledge and skill set to heal it.